In October of last year, Steve Hall, CEO of driversselect – an Echo Park company, stood in front of a packed room of employees for their monthly all-employee kickoff. It had been a great meeting full of updates, planning and hugs all around as the company had successfully moved into it’s new home in Grand Prairie. But as Steve stood in front of his employees, he issued a challenge. The challenge was to sell more cars than they ever had in the next two months. If this challenge as met or exceeded, he would donate $50,000 to Vogel Alcove, their partner charity. If you don’t know driversselect, they are a unique company. They recently won the #1 spot for Top 100 Best Places to Work by the Dallas Morning News, an award given based on surveys of their employees. They have strong core values, a great culture and have award winning sales, support and customer service, sure… but what makes them stand apart is that they live and breathe all of those things. They adopted Vogel Alcove as their partner charity after learning about the comprehensive services we provide to our families. They’ve bought in on the importance of giving back to their community and have gone above and beyond in their efforts to engrain Vogel Alcove into their culture. incorporated an ask in their sales process and paperwork to all vehicle purchasers to donate $10, and they will match $10. As of the end of the 2018, they not only beat their quota to ensure the donation promised, they broke all of their previous sales records. In January, they invited Sammy Gonzalez, Chief Marketing Officer for Vogel Alcove to their monthly kick-off to receive a $50,000 check and to speak on behalf of the organization. 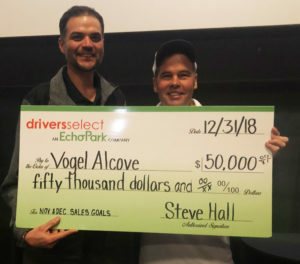 Chief Marketing Officer Sammy Gonzalez received a “large check” from driversselect CEO Steve Hall after a record-setting challenge was accepted and met. We are grateful to have an amazing partnership with this innovative company. They routinely send employees over to our monthly open house Coffee with the Kids to further educate employees on their partnership with Vogel Alcove. We appreciate and value driversselect and their employees and look forward to the long-lasting relationship. Want to get your company involved? We have ways to incorporate the largest and smallest of companies. Just let us know how you’d like to get involved … we look forward to hearing from you! Visit our Community Heroes page to learn more.